← Welcome to my world, Tim Cook! 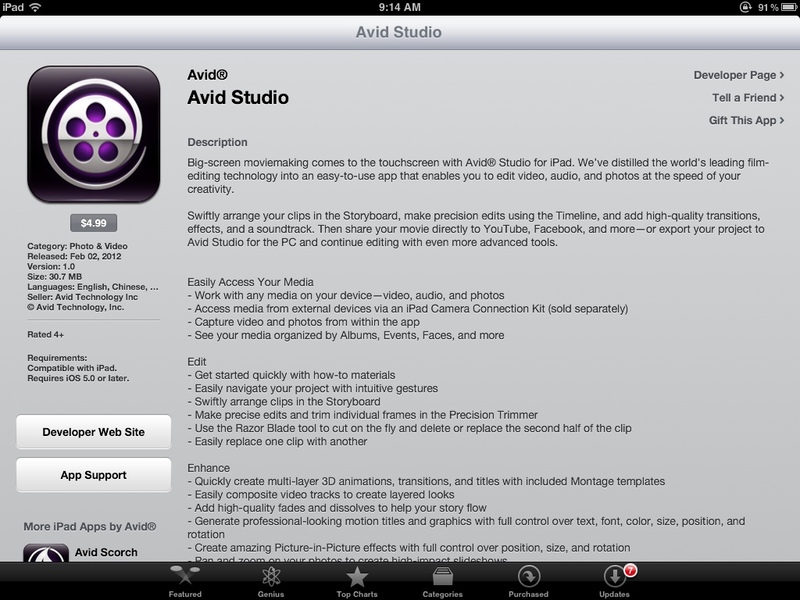 I read this morning on Engadget that Avid has entered the video editing fray on the iPad. For $5, the same price as Apple’s own iMovie app, we now have another offering from the 900 pound gorilla of the space. For those of you not familiar with Avid, they were pretty much the king of the NLE space until Apple started giving them fits with Final Cut Pro. Before FCP, Avid was a super expensive software package that ran only on super high end rigs and pretty much required crazy expensive custom hardware. They still offer that stuff and it is used extensively in the industry, but FCP forced Avid to continuously lower the price and hardware bars to where they are today; you can purchase a software-only solution that runs decently on an iMac or MBP and doesn’t cost all that much more than FCP (FCX again changed the dynamic). All a long way of saying that the release of Avid Studio for the iPad is the next step in a trend that has been going on for a while, with Avid continuously chasing Apple down the price/hardware requirement scale. So…no big deal right? 1) It will continue to foster creative solutions for using a touch UI for video editing. Apple invented some conventions and borrowed others for iMovie for iPad. There are other apps in the space as well doing the same. But I believe that a company with Avid’s scope and focus will bring new energy to the discovery of best practices for a touch UI and video editing. 4) It portends the continued evolution of the iPad as a serious productivity tool. No, I don’t believe this app can replace a full editing rig as things stand today. But I am certain that it (and iMovie…) will continue to broaden the feature set, slowly removing yet another slice of functionality that stood in the way of the iPad being capable of “everything.” I used to say that professional video editing was one of the few things you still really need a Mac/pc for. By the time we see the iPad 4, the 3rd or 4th rev of this app, iOS 7, and custom hardware accessories, I can imagine that no longer being the case. 5) It adds further legitimacy to the platform overall. When Microsoft does the inevitable and releases Office for the iPad, it will do the same (but 1000 fold given Office’s ubiquity). This is good. Apps from serious companies which do serious things will help open the eyes of naysayers who still foolishly see the iPad as nothing more than a glorified media consumption device. This entry was posted in Apps, Features, Musings and tagged Apps, Features, iOS, iPad alone, iPad primary computer, Musings, video editing. Bookmark the permalink. You know I have to admit I’m not an IM guy at all. At all at all. So it’s not been something particularly on my radar as far as iPad/iOS solutions go. So thanks for reminding me of this as it’s not something remotely niche-y the way say high end video editing is. So if it’s critical for you then the iPad Alone may not be such a great solution. That said, I’m surprised that there aren’t any universal IM apps whose background capabilities are sufficient for the needs you outline. If you read this, would love to hear what the scenarios are (more specifically) where iOS falls down. Thanks! Thanks for posting Mike. I agree – that app is a blast and really the kind of thing that blows my mind and makes me imagine the down-the-road possibilities. It’s already a very sophisticated little app which gives incredible capabilities in a totally casual setting. Imagine those kinds of effects, with more precise control, built into Avid or iMovie. Wow!